Are you considering getting a new kitchen? Our kitchen fitters are experts in the installation of luxury bespoke kitchens. We know that the kitchen is at the heart of every good home. It is therefore vital to us that not only is it installed quickly but that it is fitted to the highest standard. At Home Trades Services our kitchen fitters are local to Edinburgh and as members of the distinguished Guild of Master Craftsmen you be sure of the high quality of our workmanship. You can trust us to work with you to produce results that are built to last and beautiful to live with. 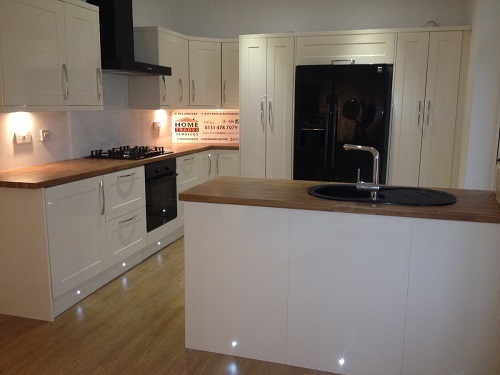 Home Trades Services consider themselves as amongst the best kitchen fitters in Edinburgh. We offer a fitting only service if you have already chosen a kitchen and need someone to install it. We also offer a full design, supply and installation service with a large range of kitchens to choose from. We can provide all the necessary kitchen fitting services to complete the job including: electrics, plumbing, carpentry, plastering, building and tiling. We will ensure that from floor to ceiling you get the beautiful finish you deserve. Doors and floors, painting and decorating, lighting and fixtures. Home Trades Services will manage your project from start to finish to ensure that it is completed to your satisfaction. We will make sure that you have the dream kitchen. A range of services, from fitting only to a full design, supply and installation. A large range of kitchens and bathrooms to suit all tastes and budgets. A one year's workmanship guarantee.